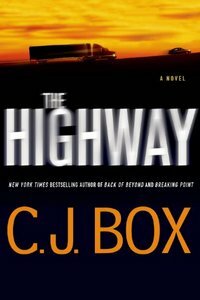 The Highway by C. J. Box: Synopsis and Online Purchase Options. Synopsis (from the publisher): When two sisters set out across a remote stretch of Montana road to visit their friend, little do they know it will be the last time anyone might ever hear from them again. The girls — and their car — simply vanish. Former police investigator Cody Hoyt has just lost his job and has fallen off the wagon after a long stretch of sobriety. Convinced by his son and his former rookie partner, Cassie Dewell, he begins the drive south to the girls' last known location. As Cody makes his way to the lonely stretch of Montana highway where they went missing, Cassie discovers that Gracie and Danielle Sullivan aren't the first girls who have disappeared in this area. This majestic landscape is the hunting ground for a killer whose viciousness is outmatched only by his intelligence. And he might not be working alone. Time is running out for Gracie and Danielle … Can Cassie overcome her doubts and lack of experience and use her innate skill? Can Cody Hoyt battle his own demons and find this killer before another victim vanishes on the highway?